Sri Lanka participated last week at the Multi Stakeholder Dialogue and Capacity Building Partnership event organized by the UN Division for Ocean Affairs and the Law of the Sea (DOALOS) within the framework of the Regular Process for Global Reporting and Assessment of the State of the Marine Environment including Socio-Economic Aspects (Regular Process). The event which was held over two days from 24 – 25 January 2019 consisted of several expert level panels discussing such issues as integrated assessments, enhancing the science-policy interface, and sharing best practices and technology through partnerships. The event also featured an information fair whereby several States and organizations presented their work and research. Sri Lanka was represented by H.M.K.J.B. Gunarathna, Senior Assistant Secretary (Development) of the Ministry of Agriculture, Rural Economic Affairs, Livestock Development, Irrigation and Fisheries & Aquatic Resources Development who was an invited panelist. Mr. Gunarathna in his presentation titled “An Integrated Approach For A Master Plan Development Project To Increase Aquaculture Production Through Conservation And Development Of The Aquatic Eco-Systems Associated With Lagoons And Inland Waters Of Sri Lanka”, noted that lagoons have been identified as an underutilized natural resource and stressed the importance of community participation in sustainable conservation. Mrs. M.N. 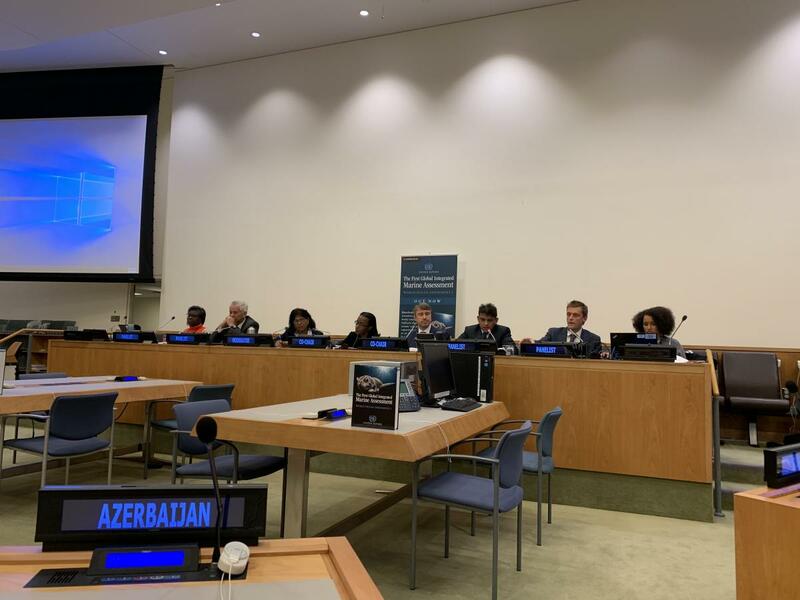 Medaduwage, Assistant Director (Admin), Department of Fisheries and Aquatic Resources and Mrs. Sonali Samarasinghe, Minister, Permanent Mission of Sri Lanka to the UN also attended the two day event. The two day dialogue provided an opportunity to build awareness and collaboration with respect to capacity-building in support of the Regular Process, including with respect to building capacity to participate in, and make use of, integrated assessments. Let me first thank the co-chairs of the Regular process, its Bureau and especially the Division for Ocean Affairs and Law of the Sea for their painstaking efforts in organizing this event. We heard with interest the presentations made by the panelists in the first session and look forward to the upcoming panels as well. As an island nation impacted by the health of the oceans, we express our unwavering constructive support to the objectives of this event as we, the international community, together, and with a common and steadfast purpose, seek to identify ways and means to address common challenges and support the implementation of Sustainable Development Goal 14. Sri Lanka welcomes the efforts within the framework of the Ad Hoc Working Group of the Whole to promote, facilitate and ensure capacity-building and transfer of technology, including marine technology, under a rule based international system and in accordance with the United Nations Convention on the Law of the Sea and other applicable international instruments. In this regard we also welcome the promotion of technical cooperation, including South-South cooperation in order to identify gaps and shared priorities to support capacity-building in marine monitoring and assessment. Sri Lanka is committed to the three aspects which we will be highlighting during these deliberations, namely, the protection and conservation of the environment, the legal framework governing fisheries among others and socio economic development. We urge states, intergovernmental and non-governmental organizations to continue to update information to the capacity-building inventory and thank those countries that have hosted regional workshops that enabled our experts to interact, share best practices, build partnerships, and learn from each other. It is vital to work together with regional organizations to gather local expertise and maximize research finding and data. Regional and inter regional cooperation, dimensions of financing and capacity-building and science based action, must always be at the core of all our efforts if we are to be inclusive and transparent in our collective actions. Bearing in mind that Experts in developing states may have been unable to contribute and provide inputs to World Ocean Assessment I (WOAI) due to capacity gaps that exist for undertaking assessments, and the financial and human resource constraints; opportunities should be provided particularly to first respondent states and also other stakeholders to participate in regional workshops to enhance knowledge and awareness. We hope that these two days will provide opportunities for an in-depth dialogue on the human, institutional and systemic needs and gaps in capacity, and will serve to foster cooperation and coordination. Rising sea levels and coastal degradation threaten the viability of lives and livelihoods in low-lying areas. Island nations like Sri Lanka are particularly vulnerable to the impact of ocean environments and climate change. Our large coastal communities survive at ocean level. For us, pollution of the oceans, depletion of fish, rise of the seas and good coastal eco systems are not abstractions – they are at the heart of our existence. Sri Lanka was closely involved from the outset with the Third United Nations Conference on the Law of the Sea towards the development of the new legal regime of the oceans. We have played and will continue to play a critical role in enabling developing countries like Sri Lanka, reap the benefits of ocean resources. To this end we have embarked on a series of environmental actions with the objective of creating awareness among the general public on the environment and blue green economy. We have begun programs to formulate and implement nationally appropriate mitigation actions to minimize greenhouse gas emissions, adaptation measures, build resilience in vulnerable sectors and communities, and fulfill national commitments on multilateral environmental agreements. Sri Lanka supports the development of an international legally binding instrument under the UN Convention on the Law of the Sea on the conservation and sustainable use of marine biological diversity of areas beyond the national jurisdiction. We look forward to establishing the limits of the ocean areas for the exploitation of genetic resources bearing in mind that all marine resources fall under the same regime applicable to the Convention. We are of the view that the marine environment, marine research and marine technology should be approached with the principle of inter-generational equity uppermost in our minds. Sustainable fisheries is a priority for coastal states economies. Benefits derived from marine areas beyond national jurisdiction must be utilized keeping with the common heritage of mankind principle, which is the underlying rationale of the Convention of the Law of the Sea.